I am a big fan of exfoliation, massage, and above all Japanese Beauty Secrets. So, i'm going to let you in on a little beauty secret... a little Japanese secret that will keep your skin soft & smooth, encourage lymphatic drainage, and bottom line just makes your skin feel good. 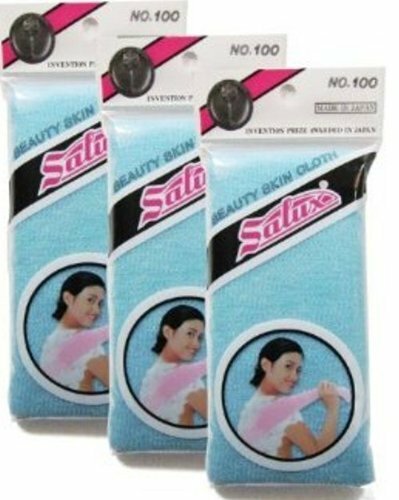 It's called the Salux Nylon Japanese Beauty Skin Bath Wash Cloth/towel - a large nylon cloth that you can literally wrap behind your back, from both sides, and scrub back and forth. I use it on my back, neck, and thighs. First things first, you must follow these instructions - first wet the cloth, turn off the shower (Save water people! ), pour a generous dollop of your favorite body wash, work the soap up into a lather by rubbing the cloth together vigorously with both hands. Within a few seconds you will see a generous amount of soapy bubbly suds - the kind you see in movies where a woman is luxuriating in a claw foot tub, with heaping waves of soap falling out of the tub. Take the soapy bubble laden cloth and start scrubbing. I like to take both ends with each hand and scrub back and forth. The rich lather and the grooves in the cloth really makes your skin feel good. Also, because it is a relatively large cloth / towel, you can be done with your scrubbing routine in about 2 minutes. I've used a lot of body scrubbers, and this is the best one I've used so far. Not only does it leave your skin soft and smooth, but it also promotes lymphatic drainage, which reduces the look of cellulite. In regards to cost, it's about $11 for a pack of three. Get some for yourself, your sister, your friend, and your boss. They will all thank you.